Articulation: Swivel/ hinge ankles, double hinged knees, swivel thighs, ball jointed hips, swivel waist, mid-torso hinge, swivel/hinge shoulders, swivel biceps, double-hinged elbows, swivel/hinge wrists, hinged neck, and a ball-jointed head. Acessories: Ultimate Nullifier device, interchangeable stretchy arms. * Hasbro has done exactly what I believe most fans wanted by delivering a straight up, no frills version of Mr. Fantastic. This is a great, standard version of Reed Richards in a normal looking suit and it just works. He looks perfect here. While most of the suit details are painted on, the paint work is very near and clean. Reed looks "fantastic" alongside of his teammates. * The headsculpt is quite nice, too, and features Reed's distinctive premature graying along the sides of his hair. I like the somewhat intrigued, possibly just a bit self assured expression look for Reed. It's probably the best Mr. Fantastic Headsculpt to ever grace a Marvel Legends line. * Hasbro has an excellent articulation scheme for their figures and Reed Richards is just an excellent example of how well made Hasbro's toys are. He's well articulated and extremely sturdy, featuring none of the overly rubbery plastic in the double hinged joints that sometimes appears in some Marvel Legends figures. He's a solid, fun toy and you just can't beat that, can you? * To make him even more fun, however, Hasbro included an extra set of interchangable arms that depict Reed's flexibility. The standard arms are removable at the shoulder and the stretchy arms swap right in. While the shoulders feature swivel/hinge joints, the rest of the arms are bendable. They look awesome and make for a very fun play feature. * Last, and yeah, kind of least (but still cool) Mr. Fantastic comes with the Ultimate Nullifier. I'm not always that up on Marvel stuff so I had to look this up. It's a device that's been around since issue #50 of the original Fantastic Four series and is used to intimidate Galactus. 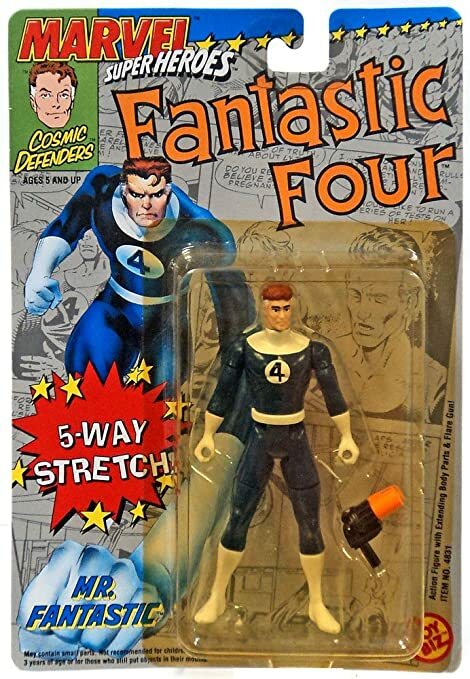 It's a powerful device and apparently an important element of the Fantastic Four universe, so good job including it here, Hasbro (although I really wanted him to have the flare gun from the old Toy Biz Marvel Superheroes Mr. Fantastic). Mr. Fantastic is a really solid and all around nicely done Marvel Legends figure. I wouldn't have bought him just for him but to complete the Fantastic Four? Heck yeah, that's a worthy goal. I don't want to sell him short, however, as Mr. Fantastic is a Great figure. The articulation is solid, the bendable arms are fun, and the inclusion of an accessory definitely adds just a bit more value. Mr. Fantastic released in the early summer but he's still out there at Walgreen's, along with the Thing now too, so if you want him you better get cracking.